Since 1986, a grand, five-story building sat unused on West 145th Street in Harlem. 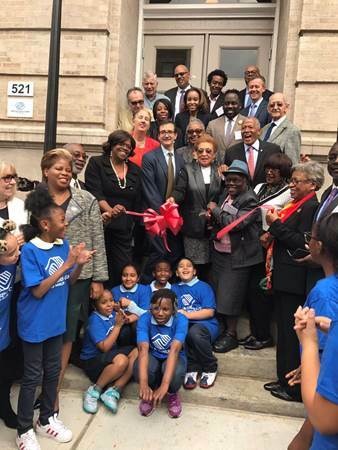 But on October 20th, the former elementary school once again opened its doors as The Residences at PS 186, a mixed-income affordable housing project and new home to the Boys and Girls Club of Harlem (BGCH). What was once the architectural and academic pride of the neighborhood is now a community development project that serves youth and low-income families. BGCH, Monadnock Development and Alembic Community Development partnered to preserve and redevelop the property into 79 apartments of mixed-income housing and a 10,000-square-foot community facility, which will be the new home of BGCH. The BGCH will now be able to expand its impact throughout West and Central Harlem – doubling its programmatic reach to serve 1,000 local youth and their families. Overall, the project was a result of exceptional public and private sector collaboration. The Low Income Investment Fund (LIIF) originated a permanent $5 million loan in partnership with the New York City Retirement Systems (NYCRS) that was critical to the success of this project. Further financing came from $32 million in Low Income Housing and Historic Tax Credits, discretionary funding provided by elected officials through the New York City Department of Housing Preservation and Development, a construction loan from Bank of New York – Mellon and tax credit equity from Red Stone Equity partners. 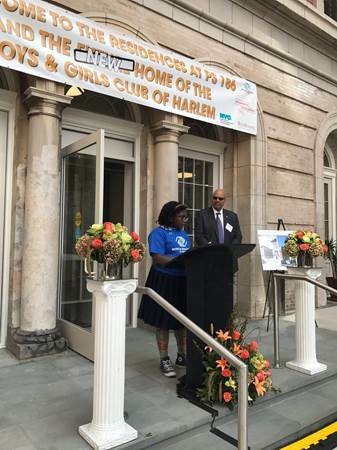 The BGCH will now be able to expand its impact throughout West and Central Harlem – doubling its programmatic reach to serve 1,000 local youth and their families. Meanwhile, all 79 apartments in this development will be leased through New York City’s affordable housing lottery process. When the building was was built in 1903, it was an architectural showcase for the neighborhood. It has now been restored to its former grace, maintaining many original features such as 14-foot ceilings, ornamental stairs and classrooms with wood trim. New residential amenities include a laundry room, community room and bike storage room. The BGCH will have access to a new Teen Center, digital media center and resources for STEM learning, college and career readiness training and financial literacy courses. As gentrifying forces continue to transform New York City, PS 186 symbolizes an integrated approach to redevelopment which is essential for a healthy and vibrant community.